This recipe is one my mother has always made. 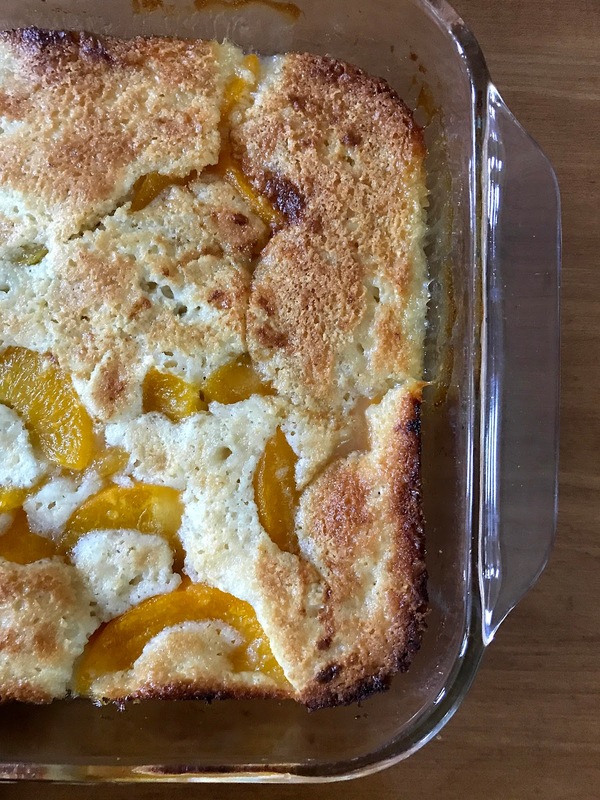 If you ask her, she will say it's not "real" peach cobbler. She loves the peach cobbler with hand rolled, homemade crust on top and fresh peaches on the inside. Yes, it's tasty. But for me??? Oh I LOVE my mother's super simple version. Quick. Tasty. Can't beat that combination!!! Recently, Caroline (7) has decided this is HER dessert to make for the family. I put the pan in the oven and take it out, but she does everything else. And she LOVES that she's making something yummy for all of us. She made it tonight, as a matter of fact, and declared that next time she makes it she WILL have vanilla ice cream to put on top for everyone. Sounds PERFECT!!! Heat oven to 350 degrees. In a 9x13 place the stick of butter and put the pan in the oven. Remove as soon as the butter melts completely (maybe 5 minutes??? WATCH CAREFULLY!!!!). In a mixing bowl, mix together flour, sugar, salt, baking powder and stir to combine. Mix in milk and stir well. No lumps are wanted in this. :) Set aside. As soon as butter is melted, remove from oven. Pour the batter into the melted butter in the 9x13. Then pour the canned peaches (juice and all!!!) on top. You may want to carefully move a few of the peaches around so that they cover the whole pan evenly. Place in the oven and bake for 45 minutes. Then wait. This is always the hardest part, by far. This is such an easy and delicious dessert!! If you keep canned peaches in your pantry, you're pretty much always ready with a treat for last minute drop in guests!! Awesome! I was looking for a good peach cobbler recipe that wouldn't take all afternoon! Thanks! Hi Rachael! The Peach Cobbler version my mom prefers is more difficult. I love this easy recipe! Hope you do, too!! Hi April! The old fashioned Peach Cobbler my mom loves does take much longer. That's why i LOVE this recipe! Faster and TASTY!!! Cobblers are my favorite desserts and peach is at the top of the list. This sounds like such a simple recipe. I'm definitely pinning it to try out. Donna, thank you so much for visiting!!! It IS very simple. Hope you and your family love it!! Looks absolutely delicious! What a wonderful treat! Delicious AND easy!!! Hope you'll try it!!! !